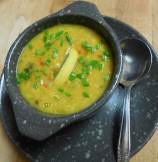 Yellow Lentils Soup is top ranked in easy soups dictionary. 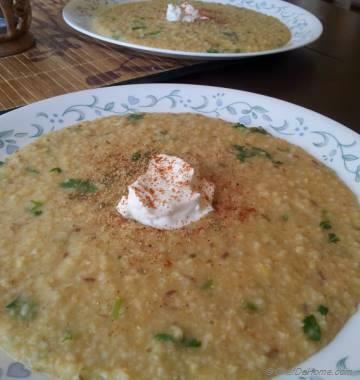 Not only in winters, I can enjoy this bowl of soup in any season of the year. This is one of the soup that I always have frozen for busy weekdays. In my childhood, whenever I were sick, my Mom always feed me lite yellow lentils soup with piece of white soft bread because both are easy to digest. But frankly I never liked it. Back then, Yellow Lentils soup was like - soup for sicks, for me. And now-a-days, I love it, more than any other soup. Lite and healthy and above all ready without paying much attention. You don't need any stock or broth to enhance its flavor. 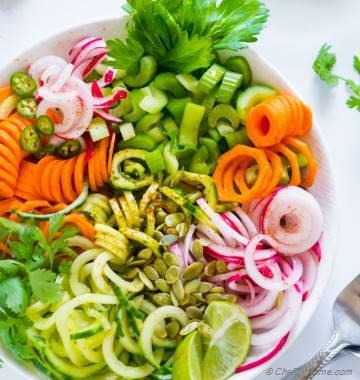 Just some turmeric, splash of lemon and garnish of fresh herbs like cilantro and chives are sufficient to make this tasty and tummy friendly soup. 1. Wash lentils under running water till the water runs clear and leave lentils aside soaked in two cups of water while you prep the other ingredients. 2. 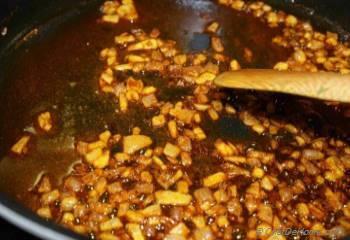 In a pan, heat 1 tbsp oil, add chopped onion, cumin seeds(if using) and saute till onion are translucent. 3. Now, add chopped garlic and saute till onion are slightly brown on the edges (about 5 minutes) Add turmeric, red pepper powder and stir and cook for 1 minute. 4. Add lentils along with soaking liquid and additional 1 cup water, salt, lemon zest. 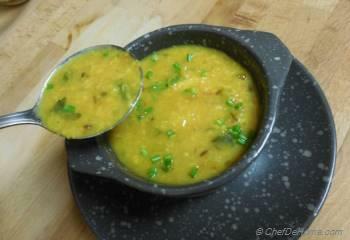 Bring to boil and then simmer till yellow lentils are fully cooked and soup is thick (about 10-15 minutes). 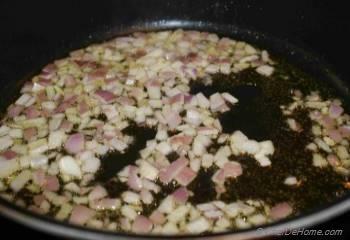 Remove from heat, stir in lemon juice, chopped cilantro, some fresh black pepper, (taste and adjust salt if needed). Serve hot garnished with slice of lemon and fresh chopped chives. 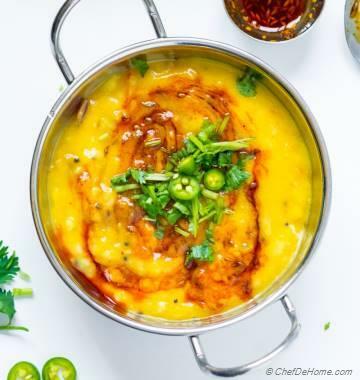 You cannot go wrong with Yellow Lentils, my all time favorite and super delicious!!! My wife loves lentil soups but I am not so fan of them. I will share your recipe with you. Best wishes for you blog. 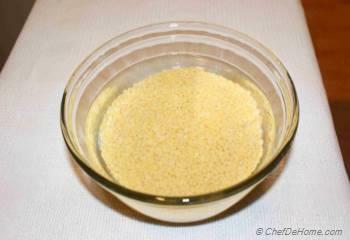 @Nishu, @Frank and @Nidhi, thanks for your wonderful comments and please keep coming back for more such recipes. Happy Cooking!! Your soup reminds me of lentils and rice I often eat at my mother's house. thanks for bringing back memories. I love lentils. 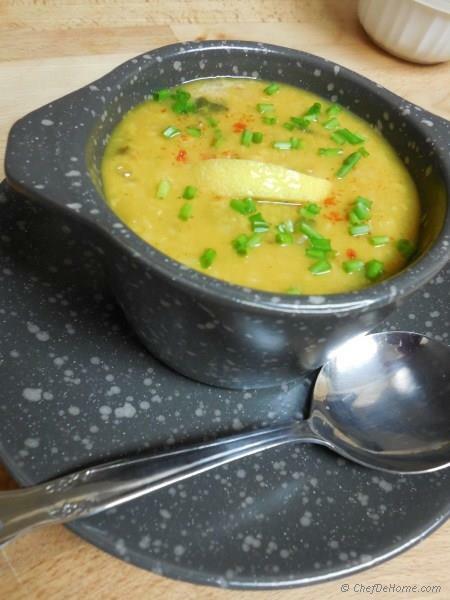 Yellow lentils soup is my favorite in all Progresso Canned Soups, I have to try this homemade version now.